Mahindra is developing a new compact SUV for Indian market which is codenamed as S201. The upcoming compact SUV is based on Ssangyong Tivoli platform. The test mules were spotted on public roads since 2017. Most of these test mules didn’t come with production headlamp and tail lamp. 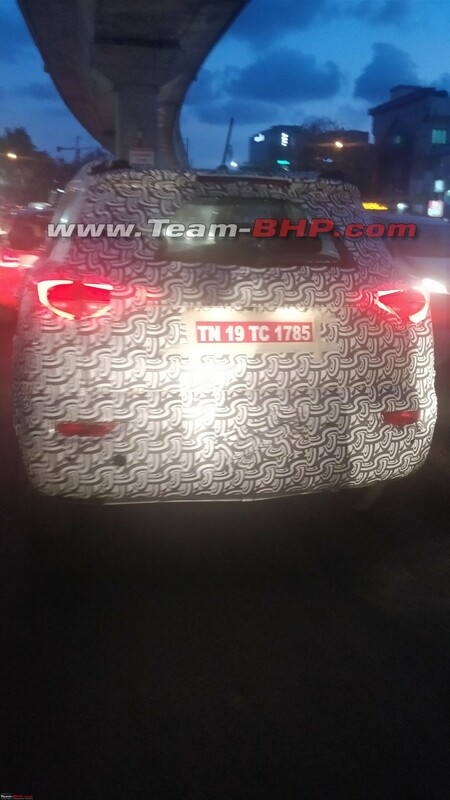 But the latest spy shots of S201 spied in Chennai reveals that the company has finalized the design for the rear. 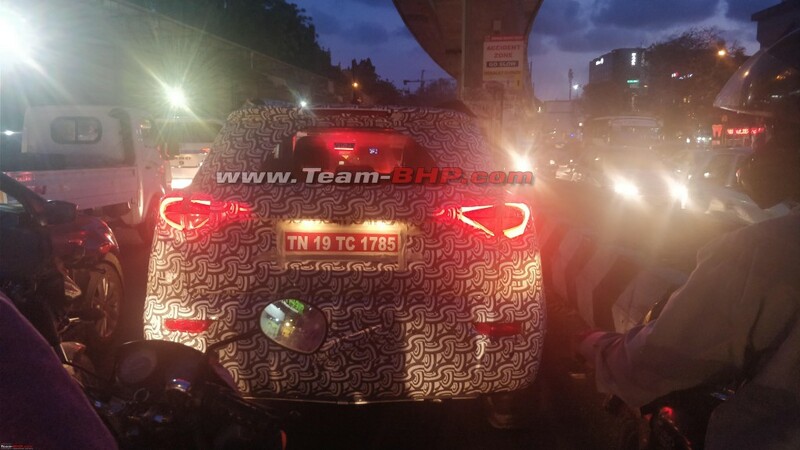 The spy shots were taken in evening and we can see the tail lamps lit up. Mahindra has given triangular LED type tail lamp for S201 which looks really good. The number plate is positioned between the tail gate instead of bumper like most of the Mahindra models. The bumper has couple of reflectors and the S201 comes with integrated spoiler and high mounted stop lamp in it. 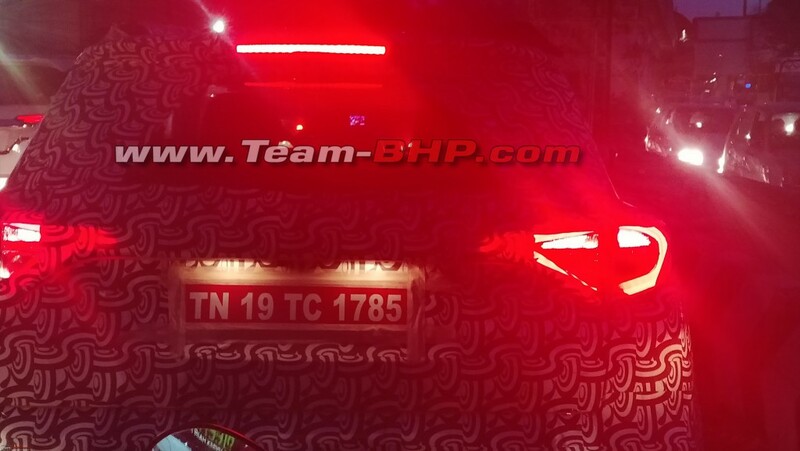 Even though the test mule is camouflaged heavily, the tail gate design is similar to Vitara Brezza and the design gives a muscular look for the S201. Mahindra is taking input from Ssangyong for the design of S201 as it is based on Tivoli. The design is going to be muscular and aggressive with SUV stance as the S201 gets XUV 500 inspired grille. The side design gives the impression of a hatchback rather than compact SUV thanks to the design of the windows. Mahindra is developing two version of S201 as one is a 5 seater and the second one is 7 seater version. The design is expected to be similar between both these models but the 7 seater get increased wheelbase as they want to improve space inside the cabin. Like the upcoming U321 MPV, the S201 is expected to get a modern design for the interior with lots of features like touch screen infotainment system, Android Auto, climate control, steering mounted control, LED DRLs, projector headlamps, cruise control, electronically controlled OVRMs, automatic headlamp, automatic wipers and more. Mahindra S201 is expected to be powered by 1.5 L petrol engine producing 90 bhp of power and 130 Nm of torque. The diesel engine is the 1.99 L mHawK engine with 140 bhp of power and 320 Nm of torque. This engine is mated to 5 speed manual and 6 speed automatic gearbox. The S201 will be launched later this year and it will compete against Maruti Suzuki Vitara Brezza.